The Sale Runs from July 22 - 15, 2015 in San Diego, California. That's when ALEC - American Legislative Exchange Council - has its 42nd Annual meeting at which corporations and their lobbyists give prepared, written legislation to state legislators from across America. With the money from these lobbyists in their pockets, our state legislators return home with the corporate prepared legislation and create laws. to ask questions at a recent ALEC meeting. 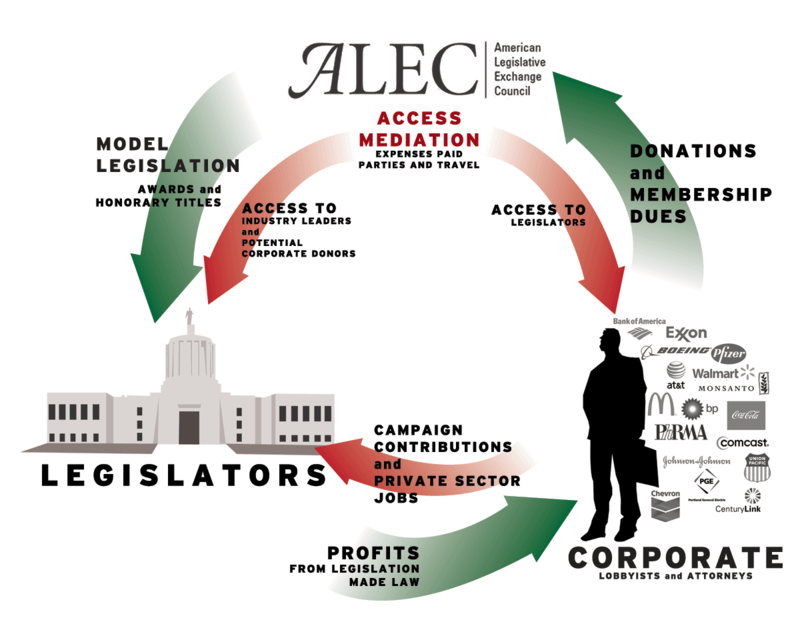 ALEC, the non-profit, corporate-funded organization that develops what it calls, “model legislation,” historically worked off radar. Thankfully, ALEC is now the subject of investigations and inquiries by several media outlets and the Bill Moyers' documentary “United States of ALEC.” It has also been shunned by major corporations (from Amazon.com to Wal-Mart) that previously paid for its initiatives. And as ALEC gathers its corporate and legislative “members” in SanDiego for their 42nd annual meeting, thousands of people are gathering in protest. If you think ALEC has no particular political agenda, take a look at their list of Annual Speakers. However, ALEC remains a defining force in statehouses throughout America. One report identified 466 ALEC bills that were introduced during in state legislatures during 2013 sessions. Today, ALEC remains an enormously powerful player in local American politics. Its influence is difficult to measure simply because the money it spreads to your elected officials pays for its own anonymity. No one involved wants you to know what is happening at these closed meetings, meetings at which your state laws are being written. 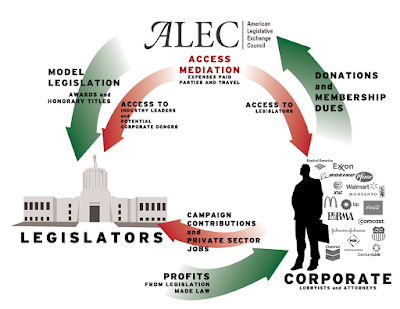 Each state has "chairs" who represent ALEC. These leadership positions are held jointly by legislators and corporation representatives. Here is a list of "chairs" in your state.